I wish it were in original spec, but that can be swapped back if the motor and other parts can be found. Sub 30k IMO if its the former. While the car is a TON of fun with all the extra power, the S14 is where a large amount of value lies. Some recent auctions of S52 swapped cars. Thanks for posting those links! Those are a good gauge of the value. Now I am not sure how much the Euro motor adds to value, but my guess would be around 3-5k. Last edited by L0ADED; Wed, Oct-25-2017 at 04:18:26 PM. Yeah I was gonna say 5k max. Please keep in mind, a lot of it will have to do with the quality of the rest of the car. If i remove the engine, what do I have? Are the fenders original and have VIN tags showing, what is the rust situation, how is the dash, etc. I've seen rollers go quiet a bit if they are complete and in good condition. Pictures and more info go a long way. Exactly what Blackhawkracing was saying, the condition of the rest of the car would be considered too. I mean all in all. 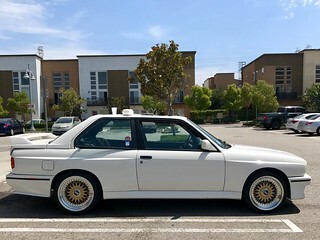 A swapped e30 M3 would not be the value of a matching Vin S14 car. All times are GMT. The time now is 02:47:47 PM.